A lot of times, you will see riders of Icelandic Horses leaning back or sitting on the cantle of the saddle, putting their weight on the horse's loins. This is a very basic, unsophisticated way to hollow a horse to get him forced into gait. It goes side by side with the "turtle man" style of riding of some Big Lick horses and other old-fashioned riding styles of gaited horses in rural areas. The chair seat was the rule with most riders until sometime, maybe a hundred years ago, until Caprilli formalized the forward seat for jumping. Until that time, people thought that the horse was similar to the wooden rocking horse, and that weighting the hindquarters (by sitting further back or leaning back), lifted the front end, but a live horse doesn't work that way which Caprilli was able to prove over a 100 years ago. 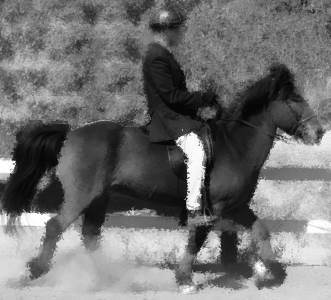 Good trainers and riders have no need to lean back, slide to the back end of the saddle, or sit on the horse's loins to force gait. 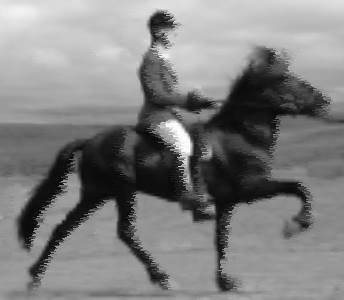 Good trainers and riders will have spent the time *teaching* the horse self-carriage and the proper aids (not cues, see the difference here) so the horse will always know how to gait by an imperceptible adjustment of the rider's body! Don't waste your time or money on a riding teacher or trainer or clinician who rides this way!